Family Friendly Beach Apartment w / Vues spectaculaires sur la baie - 100m de la plage! Envie d'une escapade dans un endroit à quelques mètres d'une longue plage de sable blanc aux eaux cristallines bleu-vert? Cet appartement moderne et spacieux de 4 chambres offre en plus un grand balcon orienté nord-est, idéal pour se détendre autour d'un barbecue ou tout simplement admirer la vue sur la baie de Fingal. L'appartement est au dernier étage d'un petit complexe de 6 et accessible par un ascenseur. Deux salles de bain dont une suite parentale. Cuisine moderne et grande salle à manger avec TV et DVD et vue sur l'eau. Grand balcon orienté nord-est avec vue, barbecue et mobilier de jardin. Double espace de voiture dans le garage de sécurité. Piscine commune et espace extérieur. L'appartement est idéalement situé à proximité des magasins, des cafés et d'une plage de surf surveillée. Beaucoup de restaurants locaux à distance de marche. Cours de surf disponibles sur la plage locale (en saison). Plage de surf surveillée (en saison) et plage pour enfants. We thoroughly enjoyed our stay & loved the property, location and the nearby shops. Looking forward to booking it again. Great family accommodation and spacious living area. Quick walk to beach and handy spot above shops for meals or groceries. We will be back !! We were only provided with one remote to open the garage which was inconvenient as we were given two car spaces to use which we needed as we have two cars. We were told that the second remote was broken. The wifi did not work at all, we were told that a technician could be sent out to take a look but we would have to stay in to wait for him, as we were on our holiday we chose not to do this. The pool was not operational for most of our stay as the gate wasn’t working. The apartment is located above shops and was very noisy. There was a generator attached to the cafe below the the entire week which was very loud. This started at 6am each day. Would have been nice to know this before we arrived, same goes for the pool. The apartment was quite dirty when we arrived. The owner sent his cleaners out to do another clean but the balcony was full of sand and the glass was very dirty still. Same goes for the kitchen and bins. The whole apartment needs a good spring clean. We needed to provide all our sheets, towels, tea towels and dish clothes. There was one tiny cake of soap, one sachet of dishwashing liquid and one toilet roll provided. We needed to clean the bbq before we could use it. We needed to go into Nelson bay to collect our keys when we arrived. As it was a Sunday we were charged a fee for this service. A coded key box would be much more convenient. We have never provided a negative review before but feel it important to let other holiday makers know of our experience. We rely on and constantly respond, as promptly as is practical, to feedback from guests during and after their stay, as we did with this guest. So, we are disappointed with this review, which is contrary to the vast majority of reviews from other guests, many who have stayed on multiple occasions. Sadly, despite numerous contact, updates and resolution of the issues raised with us, it was not enough. * Pool was closed for safety and legal reasons - now re-open. * Cleaners returned the day of arrival for a make good clean. * Wi-Fi, is new in the apartment and is working. In addition to details regarding the apartment and its facilities on HomeAway, we email arrival information ahead of stays so guests are fully aware of details such as key collection and the need to bring linen (or hire locally) and we suggest guests contact us if they've any further queries before arrival or during their stay. There will always be some matters we cannot control, typically external to the boutique apartment complex. 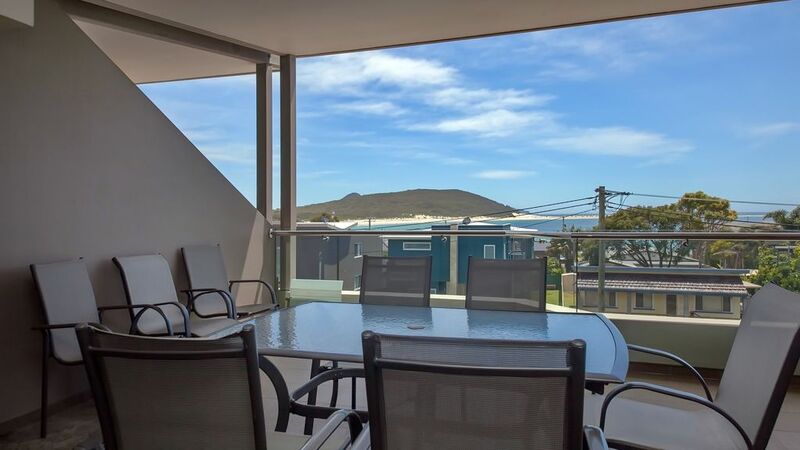 However, what makes it special for most guests, is the convenience of the apartment to the local shops and restaurants, as well as the views from the balcony and the proximity to the stunning Fingal Bay beach. In peak season, like most coastal areas in Australia, it is busy but lots of fun, even more so with the fabulous summer we're having. The overall experience was amazing, however, there were some little flaws. One of the stoves do not function. Athough we were warned of a problematic internet connection, the internet was non existent. The convenience of the area was unparalleled as everything you need (groceries, food stores, bottle-Os, etc) are just down the elevator. The beautiful and quiet Fingal Beach was also just a stone's throw away from the apartment. Lovely spacious accommodation, sea view and proximity to local beach.Everything we needed for a family weekend retreat. Large pool area on the same level as this unit works well. We'll be back.